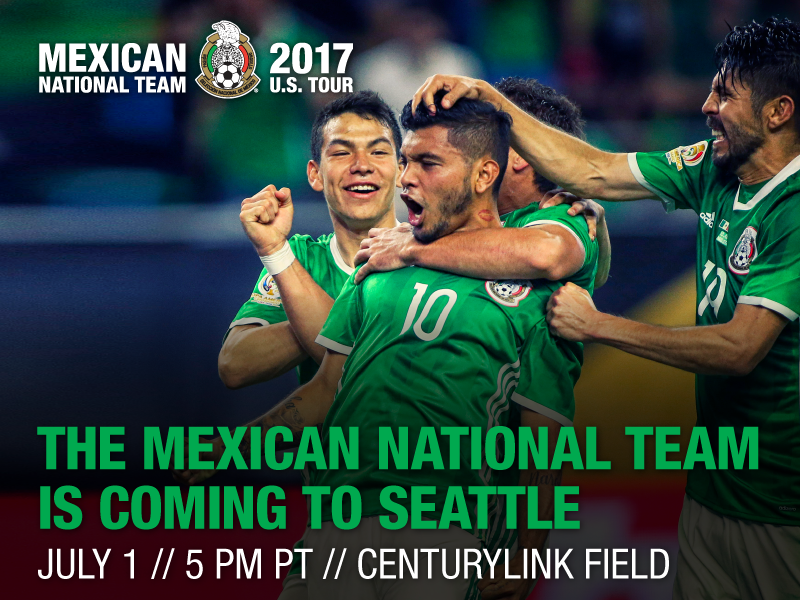 The Federación Mexicana de Fútbol (FMF), Soccer United Marketing (SUM) and Seattle Sounders FC announced that the Mexican National Team is coming to CenturyLink Field on Saturday, July 1, with kickoff slated for 5:00 p.m. PT. The match is the squad’s final fixture before attempting to defend its title in the 2017 CONCACAF Gold Cup – the region’s official international competition – after Mexico won the 2015 tournament. Mexico’s opponent for the July 1 tune-up match is being announced at a later date. The game is part of the landmark 15th annual Mexican National Team U.S. Tour, which began on February 8 in Las Vegas with a 1-0 win over Iceland in front of a record-breaking audience for soccer in the city. Mexico is also set to play in Los Angeles on May 27 versus Croatia, June 1 in the New York-New Jersey metropolitan area against Ireland and June 28 in Houston against Ghana. Mexico’s history at CenturyLink Field began in 2008 with a 1-0 win over China and continued in 2011 with a draw against Ecuador. Both matches were played in front of over 50,000 fans as part of Mexico’s annual U.S. Tour. Mexico last played in Seattle as part of the 2013 CONCACAF Gold Cup, defeating Canada 2-0 in the Group Stage. El Tricolor is using this year’s Seattle game as a final tune-up before its 2017 CONCACAF Gold Cup opener in San Diego on July 9. The Tour, sponsored by adidas, Advance Auto Parts, Allstate Insurance Company, AT&T, Bud Light, Coca-Cola, el Jimador, Makita, Nissan, POWERADE, The Home Depot and Wells Fargo, visits five cities across the United States in 2017, and is being broadcast nationally on the Univision and FOX family of networks, as well as on the Fútbol de Primera Radio Network.